Lateral entry class - KRASS e.V. KRASS e.V. has launched a new project with a so-called lateral entry class. These types of classes aim at specifically teach children and young adolescents without prior knowledge of the German language according to their individual needs. The main focus is on teaching the German language, however, all subjects are taught. At Dieter-Forte-Gesamtschule (Dieter Forte comprehensive school) in Düsseldorf, KRASS e.V. helps to make classes more vivid and exciting for students of the lateral entry class and to further promote communication with one another. In return, this project, offered once a week for two hours, is attached to attending German classes. While passing through various artistic processes, the students learn how to overcome communication barriers and how to gain self-reflection and mutual respect. For instance, life-sized self-portraits are drawn and presented in the group. Each student therefore introduces his or her neighbor and describes their drawing as detailed as possible. Apart from describing anatomic details, the students are also asked to describe memories of their homeland as well as wishes for the future. This exercise particularly focuses on mutual compliments and the appreciation for one another. Afterwards, the drawings are exhibited in the school library. KRASS e.V. is currently working on another project which will confront the students with the topic of “dream house”. 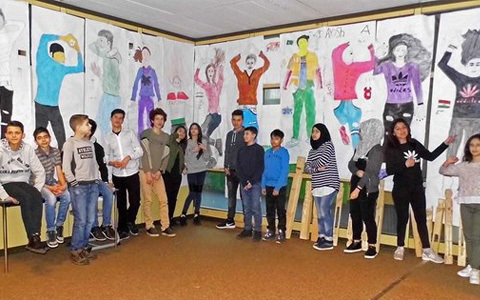 This project is carried out every Tuesday at Dieter-Forte-Gesamtschule, Heidelberger Str. 75, Düsseldorf, by the artists Barbara Rückert and Anja Sonneson.